I got an email from Alan Merton today regarding upcoming changes at the GMU campus. All I can say is..wow. For those of you who know/attended Mason this will be interesting. For everyone else this will be mind numbingly boring so check out the links in the previous post. When I left in 2k2 they were just about to begin on a new building for meeting spaces/tv station as well as more dorms. The dorms can easily be seen while driving on Braddock road at the corner of Braddock and Roberts Road. 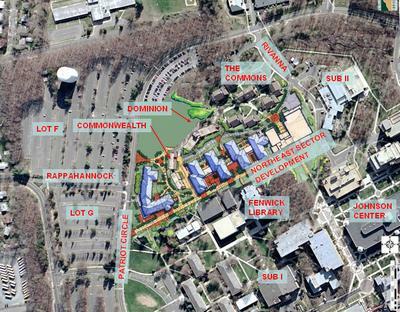 As you can see this is going to go right in front of Essex (my old dorm), through the woods and end at the parking lot. I don't know how I feel about this. Part of me wishes that I would be a student in 2k7/2k8 when it's finished. It looks like it would be fun! Part of me is sad because I know that area and it seems like every place where you can stick a building in this county..they stick one. The proposed buildings are a new dining hall, a fitness center (yes another one. This will make 4 buildings that deal with fitness), and 4 dorms that will have a total of 1000 beds. For more info you can go here.